The Caps beat the Bolts on Friday night at Verizon Center with a little help from a Troy Brouwer hat trick by a score of 4-3. The Caps came out strong but played it safe with the lead. With Tampa charging back at the end of the game, the Caps stepped up and eked past the Lightning sending them home with a loss. The Lightning Bugs came out flat and gave the Caps 3 power plays in the first 5 minutes with almost no time in between. 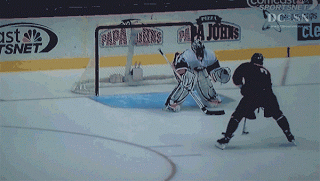 Ovechkin was the first to take advantage with a Jordan Crawford style 35 foot shot. Unlike Crawford, this one went in the net. 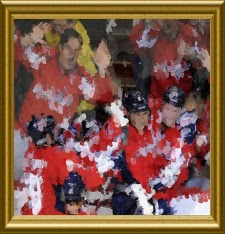 The Caps picked up a Brouwer PP goal on their 3rd try and all of a sudden it was a quick 2-0 lead just 6 minutes into the game. Brouwer picked up his 2nd goal in the 2nd, and a 3-0 lead was looking good for the Caps. Despite playing behind the goal again instead of in front of it on one crazy play, the standard goalie Tomas Vokoun picked up another win giving up 3 goals. The first goal was a sneaky play where Martin St Louis picked the pocket of a Chimera who wasn't paying attention and passed it to a teammate who put it through Voko and into the net. Tomas was like a brick wall, he barely moves but he takes up some good space. I still laugh when he does his Coffin save and he lays on his back like an overturned turtle. A stupid delay of game by Hammer Bros after a huge PK gave the Lightning another 2 minutes and the game was all of a sudden 3-2. Just like against Pittsburgh 2 nights ago the final few minutes was a barrage of offense by the away team looking to score a desperation goal. With a minute left in the game the Lightning pulled their goalie and Troy Brouwer picked up a wide open empty netter and picked up the (cheap) hat trick as hats rained down on the ice. I may have to come back and edit this like the Wideman trick earlier. This was basically the dagger, but the Lightning ended up scoring with 10 seconds left. A shot by the Bolts hit the side of the net but luckily, the Caps survived and picked up the huge 2 points in the standings. Guy with no visor, face is bleeding, call a detective. Brouwer looks like a Quarterback from like 1980 when shoulder pads were huge. Locker says you can get your hat back at customer service?